The Municipality of Rosario, Batangas, Philippines lies at the intersection of 13º 50' 43.90" North latitude and 121º 12' 22.75" East longitude (see description in Waypoints). It has a total land area of close to 280 square kilometers. Rosario is situated at the southeastern portion of Batangas Province along with its southeastern boundaries with Quezon Province. It is bounded on the north by the Municipality of Padre Garcia and Lipa City; on the south by the Municipality of Taysan and the Municipality of Lobo; on the east by the Municipality of San Juan and Quezon Province; and on the west by the Municipality of Ibaan. The municipality belongs to the 4th Congressional District of Batangas. It is also approximately 93 kilometers from Manila, the capital of the Philippines; and 23 kilometers from Batangas City, the provincial capital. 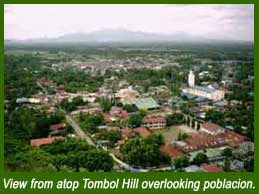 It is also 13 kilometers from Lipa City, the major urban center of the 4th Congressional District. Rosario is also considered as among the interior municipalities of the Batangas Bay Region, which comprises 4 coastal municipalities, an island municipality and 9 interior municipalities whose catchment areas drain into the Batangas Bay.